I know that Cookbook Exploitation Month ended, well, almost a month ago. But we're still pumping out blog posts about all of the brand new recipes we tried during that glorious month! Here's yet another keeper. 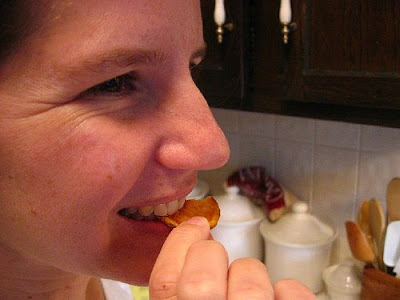 We turn once again to my girlfriend Daisy for an easy and inexpensive recipe for tapas-style potato chips. These are not the ultra-thin (and usually ultra-salty) potato chips most Americans know and love. These chips are more robust and much sturdier, with a delightful, heavy-duty crunch. If you have a mandoline in your kitchen, this recipe will give you a good opportunity to use it. We used our food processor to slice the potatoes instead. 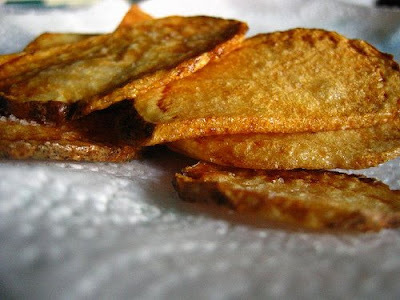 I can barely do justice describing the sheer fun of dropping these potato slices into boiling oil, watching them burble around for a minute or two, and then happily crunch into them just moments after we made them. What a blast. modified slightly from Daisy Cooks! 1) Slice the potatoes thinly with a food processor, a mandoline, or, if you're a glutton for prep work, with a knife. While Daisy recommends that your potato slices should be roughly the thickness of a credit card, we used our food processor to make 1-2 millimeter thick slices and we were quite happy with the result. 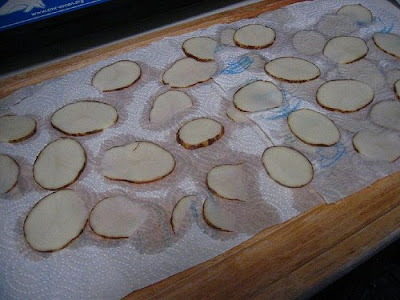 2) Rinse the potato slices in a large bowl of cold water, lay them out on paper towels, and blot them completely dry (this step is important). 3) Pour enough vegetable oil into a large and deep cast iron or non-stick pan so that the oil is at least 2" deep. 4) Heat the oil until quite hot, around 350-375F (use a thermometer if you have one that goes that high, or you can use a lower-tech test suggested by Daisy herself: dip the tip of the handle of a wooden spoon into the oil, if it gives off "a lively sizzle" then the oil is hot enough). The oil should not be so hot that it is smoking. 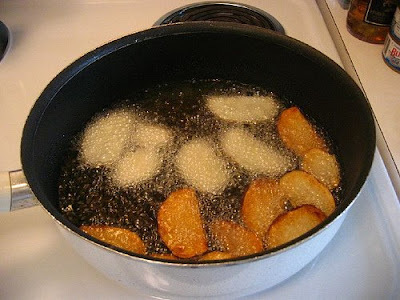 5) Slip 8 to 10 of the potato slices at a time into the hot oil, and let them fry until they turn a deep golden brown, maybe 1 minute or so. If you want to get a bit complicated, you can also run shifts of potato chips at various stages of done-ness to move things along a little faster (see photo below). 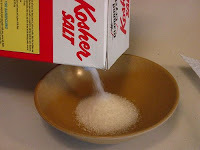 6) Drain the chips on paper towels and sprinkle with a few grains of kosher salt to taste. Let them cool a bit, then eat and enjoy! Each potato will make roughly 15-20 chips, depending on thickness. 1) The original recipe calls for peeled potatoes, but we left them unpeeled (but washed) and were happy with the result. 2) Be sure to blot the chips dry fully. Failure to follow this instruction will cause oil to spatter everywhere. Also, for the love of god, do not make this dish naked. 3) No need to use excess salt. Just a few flakes of kosher salt per chip is enough to give these guys the right amount of zing. A potential modification to consider: a pinch of cayenne pepper! 4) You can save the oil and reuse it the next day on more potatoes if you like. I think she likes 'em! 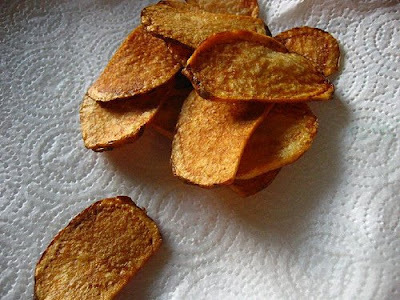 What a great post--I love chips, and thicker, homemade ones sound perfect. Especially sprinkled with salt and cayenne. And I had to guffaw at your warning to not make these naked! I made these last night and Oh. Man. They were delicious. My boyfriend and his friend who was over demanded I make them every time they get together. We'll see about that part... but they turned out fabulous! pfendnerwithap: thanks so much for the feedback, and I'm so happy you had a great experience making these. This is exactly why I blog. Thank you!